The Miami Sports and Exhibition Authority started out years ago with a plan and lofty goals, but by the time the board members voted yesterday to abolish it, it had become an example of a badly managed political slush fund and named defendant in a handful of lawsuits filed by it's Executive Director and Chalks Airline, one of it's leaseholders. (I've written about these lawsuits HERE and HERE. Those discrepancies were never discussed by the MSEA Board, nor has that audit ever been reviewed and/or approved by the board. That's a seriously big problem. How does a group of supposedly upstanding citizens abolish a public board when there are outstanding accusations of financial mismanagement, and these board members instead of discussing these issues, decides instead to abolish the board? It was the fiduciary responsibility of the board to address the issue of the disputed audit before making any decision to abolish the board, and their failure or refusal to do so constitues what has to be a naked and flagrant effort to engage in a coverup of allegations of the misuse of public money. We'll see what happens at the October 11th Commission meeting when the commissioners vote on whether to accept the MSEA Board's decision to abolish itself. There were 3 items of interest at yesterday's meeting. The first item was board member Christina Palomo's effort to get the board to reconsider the $3 million that Commissioner "Coco Loco," mislead them into believing was money that the city had requested from the Trust. You'll notice that Commissioner "Coco Loco," immediately upon being confronted with this request moved to have it postponed to the next meeting because he wanted a verbatim transcript of what he had said. This exchange starts at 9:48 on the video. If he really wanted a verbatim transcript of what he had said he could have merely logged on to this website and link on my September 13th story where I had posted the audio of the meeting, and a partial transcript that included his motion to give away the Trust money. I said, General Fund reserves, General Fund..."
The board split 3 to 3, and "Coco Loco" cast the tie-breaking vote to deny Palomo's request to reconsider asking for the money back. The third item of importance was a one-year commercial dockage license agreement between a company called Cara Bella I, LLc and the Trust to dock their floating restaurant along the park's seawall next to the Intercontentinal Hotel. The discussion on this item starts at 41:22 on the video. I alluded to this deal when I posted a copy of the lobbyist registration for my bestest pal former Commissioner Marc "Punky" Sarnoff, that showed he had registered to represent a gentleman named Dimitry Kulkov. Turns out, that as usual I was right, and Kulkov is listed as the one of the owners of Cara Bella I llc, along with Kirill Homich. The agreement calls for an initial payment of $300,000, with a 7% revenue sharing after the restaurant reaches $5 million in gross revenue. It's an ambitious undertaking for Kulkov, who used to play hockey for the Florida Panthers, and his partner Kirill Homich, who a Google search indicates is a professional poker player. The first mailer has been sent out by the Miami Freedom Park - Freedom is this case represents the freedom to screw over the taxpayers of Miami - in support of the David Beckham soccer stadium deal. As usual with these mailers, the truth is seldom revealed in what they say, but rather in what they don't say. 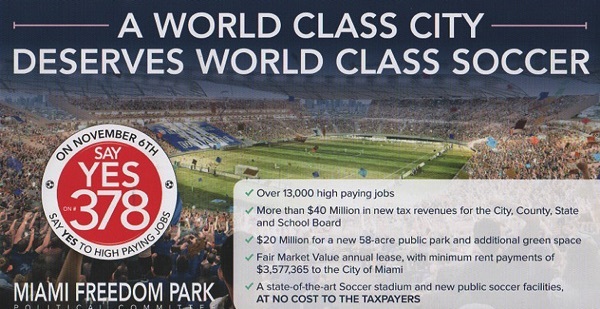 Between now and election day I'm sure that I and others will focus on all of the projected benefits listed in this mailer, but today I just want to focus on the last one, that claims that, "A state-of-the-art Soccer Stadium and new public soccer facilities AT NO COST TO THE TAXPAYERS. The cost to the taxpayers for this "state-of-the-art Soccer Stadium and new public soccer facilities," starts with the 73 acres of public land that the city is giving them for the stadium, the soccer facilities, the million square feet of commercial space, the hundred thousand plus feet of retail space and the land on which to build their 750 room hotel. That property is worth tends of millions, if not a hundred million or more dollars. The second cost to the taxpayers are all of the highway and road improvements, including new access roads from Lejune Road onto the property. 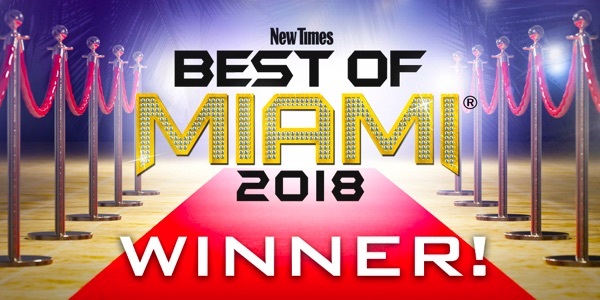 And that's just for starters, because the real screwing of the taxpayers will come when, if this referendum is approved, the Mas brothers and their partners meet behind closed doors with those morons running the city of Miami to negotiate a lease. It will be during these negotiations - which I've been reliably told have already illegally started so as to get a jump on the timeline that is claimed will be needed to build the stadium - that the down and dirty deal making will take place. 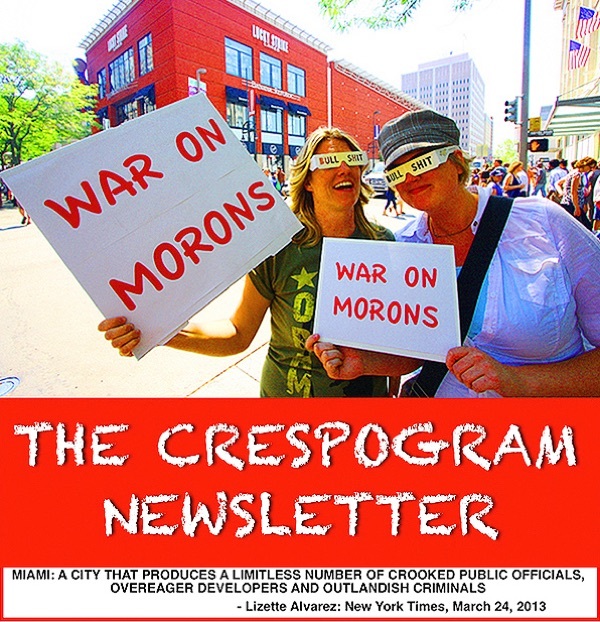 So if you're a taxpayer in the city of Miami don't ever believe for one minute that you're getting anything for free from Jorge Mas, Jose Mas David Beckham, or any of their partners except a royal screwing without a kiss.